We’d love your help. Let us know what’s wrong with this preview of Fidelity by Wendell Berry. "Berry richly evokes Port William's farmlands and hamlets, and his characters are fiercely individual, yet mutually protective in everything they do. . . . His sentences are exquisitely constructed, suggesting the cyclic rhythms of his agrarian world." --New York Times Book Review. To ask other readers questions about Fidelity, please sign up. "They practiced an old-fashioned independence, an old-fashioned generosity, and an old-fashioned fidelity to their word and their friends." The above quote is one I pulled from one of the five short stories offered here by Wendell Berry, an author I can easily call a favorite after just reading three of his works. The quote, however, truly sums up the people that we meet in all of his books, those of Port William, Kentucky. I first fell in love with Berry’s writing over a year ago when I was intr "They practiced an old-fashioned independence, an old-fashioned generosity, and an old-fashioned fidelity to their word and their friends." The above quote is one I pulled from one of the five short stories offered here by Wendell Berry, an author I can easily call a favorite after just reading three of his works. The quote, however, truly sums up the people that we meet in all of his books, those of Port William, Kentucky. I first fell in love with Berry’s writing over a year ago when I was introduced to his novel, Jayber Crow. The meditative tone and the simple yet elegant prose spoke directly to me and soothed my soul. I knew then I would eventually read everything Berry had to offer. In this collection, I met some characters with whom I was already familiar, and met some new ones as well. Even in his short works, Berry is able to convey the true essence of his characters. You will nod your head and feel you understand exactly where they are coming from. There is something about the family unit that is just so beautiful in the people of this small agrarian community. You feel as if perhaps we are sadly missing out on the real importance of family, friendship and community in this day and age. I felt nostalgic for a past that I was never really a part of to begin with, yet felt that I had been somehow because of the power of this writing. "She had learned to think of herself as living and working at the center of a wonderful provisioning: the kitchen and garden, hog pen and smokehouse, henhouse and cellar of her own household; the little commerce of giving and taking that spoked out along the paths connecting her household to the others; Port William on its ridgetop in one direction, Goforth in its valley in the other; and all this at the heart of the weather and the world." Berry walks alongside us through acts of admirable and courageous forgiveness, we question and then understand the power of true love, we ache for a man come home from war and welcome him with open arms along with his family, we yearn to allow our loved ones to die with dignity, we stand up for one another at all cost, and we never forget those who may need us in times of catastrophe. I felt a part of this loving and generous community for a few short days and am grateful for it. I believe I could happily spend the rest of my life reading books written by Wendell Berry to the exclusion of other authors. Picking them up one after the other, then starting all over again. His words have the same effect on me as Willa Cather's writing; quiet, gentle, persuasive, making me feel the world is a better place, and leaving me with a sense of peace. There are 5 stories in this collection, all within the confines of Port William but spanning the entire history of the community. The f I believe I could happily spend the rest of my life reading books written by Wendell Berry to the exclusion of other authors. Picking them up one after the other, then starting all over again. His words have the same effect on me as Willa Cather's writing; quiet, gentle, persuasive, making me feel the world is a better place, and leaving me with a sense of peace. There are 5 stories in this collection, all within the confines of Port William but spanning the entire history of the community. The first story, "Pray Without Ceasing" and the title story " Fidelity" are the longest and best. The other three "A Jonquil for Mary Penn", "Making It Home", and "Are You All Right" show us the importance of love and acceptance and a sense of home and belonging. The title story, "Fidelity" is about Burley Coulter. He happens to be my favorite character in the Port William books, and I have long wished he would have his own book, telling me more about his life. This story is it ; his life and death and loves and friends. This book of short stories is written by Wendell Berry, a philosopher, poet, and purveyor of human souls. If you have not ever read any of his work, you are missing something remarkable. This collection would be an excellent place to begin. Pray Without Ceasing is the story of one friend killing another, a senseless murder and one that might destroy two families instead of just two men. But in the fictional, but very real, world of Port William, people overcome the baser side of themselves and This book of short stories is written by Wendell Berry, a philosopher, poet, and purveyor of human souls. If you have not ever read any of his work, you are missing something remarkable. This collection would be an excellent place to begin. Pray Without Ceasing is the story of one friend killing another, a senseless murder and one that might destroy two families instead of just two men. But in the fictional, but very real, world of Port William, people overcome the baser side of themselves and the result is plaintively moving. Berry writes so purely and so beautifully that he can make me weep over a short story as if I had spent much more than a brief hour and sixty pages of reading. A Jonquil for Mary Penn is another example of Berry’s ability to see beyond the surface and explore the depths of a person and their loves and insecurities. He might be the best at describing farm life and making you feel the blasts of cold and the joys of spring of any author I have ever read, for he captures in equal measure the isolation and the deep sense of community, and the personal joy of love. At times she knew with a joyous ache that she completed him, just as she knew with the same joy that she needed him and he completed her. How beautiful a thing it was, she thought to be a half, to be completed by such another half. When had there ever been such a yearning of halves toward each other, such a longing, even in quarrels, to be whole? The wholeness came upon them as a rush of light around them and within them, so that she felt they must be shining in the dark. Making it Home is the return of the soldier from a foreign war, the unreality of finding home unchanged when the man has been changed irrevocably. There is nothing sad, but something very poignant about this story, and I finished it with tears swimming in my eyes and echoes of The Prodigal Son vibrating in my head. Tell your Granny to set on another plate. For we have our own that was gone and is come again. Fidelity . I know why the book took the name of this story. It is the story that encapsulates all this book is about; the people, the place, the sense of belonging, the heart of friendship and family. Burley Coulter is dying, the same Burley Coulter we saw at fifteen on the day Thad Coulter shot Ben Feltner. He is a man who belongs to the natural world of Port William and to its people in a way that few others do. Loving him, wanting to help him, they had given him over to “the best of modern medical care”--which meant, as they now saw, that they had abandoned him. Too late, they realize that Burley should have been allowed to go back to the land, in his own place, among his own people. I particularly loved this story, because it is about not only letting go, but how we let go, and I think that is a dilemma that many of us struggle with in our lives, as we grapple with the machinery that keeps us alive past our usefulness or keeps us locked in a sterile room with limited visiting hours, instead of resting in our own bed surrounded by loved ones. He has disappeared into his people and his place, not to be found in this world again forever. That is an eulogy that any one of us could be proud of. Are You Alright? The final story is just a lovely vignette that ties up the book and puts it to rest. I think it is significant because everyone is alright, even those who are not, because they are in their places, surrounded by friends and family, understood and forgiven. They are fine, because they fit into a world that they love and that loves them right back. They have substance and someone who cares enough to brave the blackwater to see if they are alright. This powerful collection of five short stories serves as my introduction to the beautiful writing of Wendell Berry and his fictional rural town called Port William, Kentucky. This town has a long history of farming and vibrates with decades of characters any reader will instantly recognize and yearn for, whether you’re Southern or not. Berry is a lifelong Kentucky farmer, writer and activist, and his gentle, sensitive prose takes us back to a time long gone and washes away all the ugly in the world . . . for a few hours at least. I can’t imagine anyone not being moved by some shared experience or distant memory kindled by these pages. There are so many layers of humanness here - desperation, forgiveness, humility, gratitude, honor, fortitude, kindness - and so many layers of landscape - furrowed fields, sunlit ridgetops, barbed wire fences, bullet-torn flesh, clouds of darkness. From my dictionary: “Fidelity: faithfulness to a person, cause, or belief, demonstrated by continuing loyalty and support.” The perfect title for these stories and these people. This is not a book for plot junkies. But I have found a new author to love - especially for those times when my soul needs a lift. About a year ago, I was introduced to Wendell Berry who became one of my most beloved authors. I read three of his books (Jayber Crow, Hannah Coulter, A Place In Time) in a space of three months. Berry writes with a distinctive quietness, a hallowed respect for nature, and an invitation to connectedness. “Fidelity” takes me back to Port William, the rural Kentucky town. There I am restored to the company and comfort of old friends. This is my fourth visit. Published in 1993, this 200-page book i About a year ago, I was introduced to Wendell Berry who became one of my most beloved authors. I read three of his books (Jayber Crow, Hannah Coulter, A Place In Time) in a space of three months. Berry writes with a distinctive quietness, a hallowed respect for nature, and an invitation to connectedness. “Fidelity” takes me back to Port William, the rural Kentucky town. There I am restored to the company and comfort of old friends. This is my fourth visit. Published in 1993, this 200-page book is a collection of five stories. It opens a window to an earlier or later time in the lives of various characters in the Port William farming community. Reading these stories is akin to keeping company with one's best friends and being spoilt again and again by their goodness, graciousness and generosity. The characters return from war, encounter unexpected violence, grow old and die, and know grief in intimate ways. But the overarching theme is fidelity - the bedrock of support anchored in a community of people who love and care for each other. Few authors write about community membership with more understanding, tenderness, lucidity and lyricism than Wendell Berry. Readers who have read Berry's Port William books will derive pleasure catching up with the Coulters, Catletts, Penns and Rowanberrys. But there is sufficient background in the stories for a reader new to Port William to know and like them. For me, it is great to be back in Port William. In this profoundly moving story, Andy Catlett recalls the killing of his maternal great-grandfather, Ben Feltner, the outsized grief felt by the family and the grace (particularly that of his grandfather Mat) they extended to the killer (Thad Coulter) and the Coulter family. In a fit of anger, Thad has shot Ben in the head for what he mistakenly perceived as Ben's refusal to bail him out of a massive debt. The enormity of his crime devastates Thad who realises to his horror and regret that he has killed the best friend he ever had. Berry delicately reveals the multi-layered sensitivity of confronting pain and grief. In wanting to learn the truth of Ben's death, Andy finds himself "fearing the pain that...surrounded the story and honoring the silence that surrounded the pain." Of Thad's anguish, Berry writes searchingly of the emptiness that accompanied wrongdoing - "so great was the pain of that emptiness, that...it exceeded weeping as it exceeded words". As in his book "Hannah Coulter", Berry communicates how our life in the present is influenced by and bound up in our past. Andy is the child of his grandfather's forgiveness - being the offspring from an improbable marriage that joins the Feltner line to the Coulter line. Berry put it so well: "...the unknown past is present in us, its silence as persistent as a ringing in our ears"; "But the past is present also. And this, I think, is part of the greater mystery we call eternity." This is a lovely story that captures the quiet appreciation a couple has for each other and the joy of neighbors working together: haying, harvesting, sewing, quilting, embroidering, cooking. Mary and her husband, Elton Penn, are poor but happy. They are part of a closely knit community of six families that live less than a mile from each other. The cover of this book is a picture of the embroidery of the Easter Lily or jonquil Josie Tom is sewing for Mary Penn who is ill. These lovely lines offer a glimpse into Mary's marriage: "How beautiful a thing it was, she thought, to be a half, to be completed by such another half! When had there ever been such a yearning of halves toward each other, such a longing, even in quarrels, to be whole? And sometimes they would be whole." In this story, Mary is sick and trying her best to hide it from Elton who has left the house to help a friend on his farm. This very short story has an ending that is pitch perfect. Can men who have been to war ever make it home? Arthur (Art) Rowanberry is finally discharged from service after being hit by a shrapnel and having recovered in the hospital. He is on his way home. War has changed him: "From a man in the light on the outside of the world, he was transformed in the twinkling of an eye into a man in the dark on the inside of himself, in pain, and he thought he was dead." Yet it is lovely to read about his quiet joy that keeps bubbling up from the inside to match the outside radiance of the sun as he walks the familiar roads toward home. I share his anticipation of the reunion with his family after three long years, his anxiety to present himself in a good light, and his gratitude that he is headed home and will soon be restored to the good earth and his kin. Art's meeting with his father brings a lump to my throat. Home coming is a cause for celebration. In his father's words, "For we have our own that was gone and has come again." This story is a powerful testament to the solidarity of a community where people genuinely belong to each other. Burley Coulter is dying. I ache as if a friend of mine is dying. His friends bring him to a hospital in Louisville because they wish to give him the best help. But he sinks into a coma and they regret their decision. Because Burley is all hooked up to a life-prolonging machine, an existence his close friends know he will hate more than anything since he is a man of the woods and hollows. Danny Branch, Burley's son, hatches a plan to take him away from the hospital. A detective, Kyle Bode, is on the case to track down Burley's kidnapper. It is most gratifying to read how Kyle ends up being inducted into a lesson in Community 101 that is far more valuable than the task he sets out to accomplish. It is almost impossible to read this story with a dry eye. It is no small blessing for a dying man to be loved so steadfastly and unerringly by every single one of his closest friends and kin. "A Jonquil for Mary" -- captured that moment when a young wife realizes her husband truly loves her, truly sees her -- I loved that story's ending. All five stories in this too small collection show Berry's gift of painting the ordinary lives of people with compassion and fullness -- "Making it Home" was another favorite -- oh they are all worth reading more than once. Oh my. The first story in this collection “Pray Without Ceasing” has made me a Berry fan for life. Thus far I had only read Hannah Coulter and was mildly impressed. But for readers who appreciate the long story and novella form, this story is a must read. The set up of theme and how it spun itself out was absolutely stunning. In this story, Andy Catlett’s grandmother tells him how his great-grandfather, Ben Feltner, was murdered in 1912 by his friend Thad Coulter. (If you have read any of Berry’ Oh my. The first story in this collection “Pray Without Ceasing” has made me a Berry fan for life. Thus far I had only read Hannah Coulter and was mildly impressed. But for readers who appreciate the long story and novella form, this story is a must read. The set up of theme and how it spun itself out was absolutely stunning. In this story, Andy Catlett’s grandmother tells him how his great-grandfather, Ben Feltner, was murdered in 1912 by his friend Thad Coulter. (If you have read any of Berry’s Port William stories you will know names – Feltner, Coulter, and Catlett.) Thad Coulter, at the age of 72 has just lost his farm, and is a desperate man who in a drunken state turns to the one person he hopes to hear him out. Ben listens, but eventually turns him out, hoping to talk to Thad after he sobers up. But obviously things do not turn work out that way. The story is really about how a close-knit community lives, dies and continues to live together over and during time. How ancestors were and still are. How instead of creating generational enmity, the actions of one or a few can create generational tolerance and forgiveness. How tragedy can be overcome rather than expanded upon. A lesson as important today as it was yesterday and will be tomorrow. This story was first published in The Southern Review, Fall 1992. The other long story in this book, “Fidelity” is not about the fidelity of marriage, but that of family, friendship and community. In this story, Burley Coulter, one of Port William’s biggest characters and social mainstays is dying in a hospital, one town over. His nephew, Nathan Coulter, knowing that this is not how Burley would have wanted to finish his life, steals Burley away in the middle of the night to allow him to die in amongst the land and trees that he loved. The story plays out within the community on the one line Nathan told his wife, Hannah. “If anyone asks, you only know that I went to Louisville.” Of course, this is illegal activity, and a detective is set upon the case. How the story plays out is absolutely delightful, and typical of Port William’s tight-knit community. Only the last story left me unimpressed. The two middle stories were short and heart warming tales of love and well, fidelity. If you still haven’t read Berry, you really are missing out on something that makes you better. All the emotions are present. Family and community, life and death at its best when Berry shares it with you. I've never been a short story fan but I do like Wendell Berry's work. As usual he's writing about the down home folks of Port William, Kentucky, with a theme of supporting friends and family along with big doses of the vast appreciation that they have as farmers and hunters for both farm and forest. I'm fairly new to the "Port William Membership." I've read enough to know the primary actors and a few of their stories. Still, these five short short tales that serve to fill in gaps left in Berry's novels can easily stand alone. They have, if I'm not playing too loose with words, enlarged my soul and enriched my mind. Berry continually explores the life and death cycle--its joys and griefs, its momentary losses and permanent gains. He traces the inter-generational connectedness that we share w I'm fairly new to the "Port William Membership." I've read enough to know the primary actors and a few of their stories. Still, these five short short tales that serve to fill in gaps left in Berry's novels can easily stand alone. They have, if I'm not playing too loose with words, enlarged my soul and enriched my mind. Berry continually explores the life and death cycle--its joys and griefs, its momentary losses and permanent gains. He traces the inter-generational connectedness that we share with one another through our common experiences and the memories these experiences produce. I can't close the last page of a Wendell Berry book without experiencing similar emotions each time. These include joy and grief, and contentment and resignation as concerns life, love and labor. The story of Burly Coulter's death was especially poignant. It probes and prods the monster of modern medical care, asking tough questions: Is keeping someone alive when the body is obviously shutting down ultimately beneficial or harmful? Who has the right to make that choice? Is it necessary for a short hospital stay to be so expensive that it can drain a person's life savings in a few days? These too easily become legal matters. "But, my dear boy, you don't eat or drink the law, or sit in the shade of it or warm yourself by it, or wear it, or have your being in it. That law exists only to serve." "Why, all the many things that are above it. Love." And love does not always cling; sometimes it lets go. I appreciate Berry's habit of emphasizing the seemingly mundane in human existence and extracting a lesson from it. I also laud his ability to keep conversations realistic. Two sentences is a lot for one of Berry's character to utter. Yet, those few words are impregnated with unutterable depth and resolve. These are felt more than heard, conveyed through ordinary action. Have you ever read a book only to envy the author's talent? If only I could be as wonderful a writer as Wendell Berry. The simplicity of his words evoke beautiful images of both scenery and inner beauty of the people he writes about. The five stories in this book are all set near Port William, a fictional town in the farmland of Kentucky. The characters are all connected in some way, just as in real small town life. The faithfulness of the characters are examined in each story; faithfulness to a Have you ever read a book only to envy the author's talent? If only I could be as wonderful a writer as Wendell Berry. The simplicity of his words evoke beautiful images of both scenery and inner beauty of the people he writes about. The five stories in this book are all set near Port William, a fictional town in the farmland of Kentucky. The characters are all connected in some way, just as in real small town life. The faithfulness of the characters are examined in each story; faithfulness to a father, wife, friend, or even one's self. In your mind's eye, can't you just see the above image? Fidelity is full of such images. Perhaps one of the reasons I loved this book is because the descriptions of these families correspond with the images I have of my father's childhood. He was raised in a very small town, worked on a farm, and had strong family ties. Or perhaps I am reminded of my own childhood in a rural community. I wish I knew how to link reviews. My Goodreads friend, Laysee, writes exactly how I feel about this collection of short stories. Long a fan of Wendell Berry, this book reunited me with people whom I have come to know, love and admire. I think my reading may have been enhanced by already knowing some of the backstories of the characters. However, each story has its own merit. This was my second reading of the collection. It was selected in a book group and the discussion was interesting. People I wish I knew how to link reviews. My Goodreads friend, Laysee, writes exactly how I feel about this collection of short stories. Long a fan of Wendell Berry, this book reunited me with people whom I have come to know, love and admire. I think my reading may have been enhanced by already knowing some of the backstories of the characters. However, each story has its own merit. 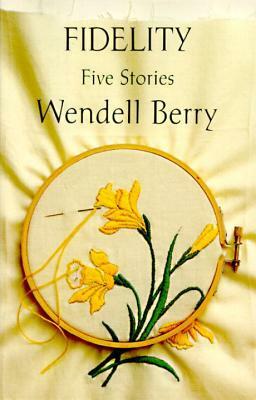 Five of Wendell Berry's short stories collected together in one place. "A Jonquil for Mary Penn" in my mind is one of the most beautiful stories in the English language. I've never read anyone who can make a sad story sing the way Mr. Berry does. If you have never read any of Wendell Berry, this is as good a place as any to begin. I decided to give this book as a Christmas present to all my brothers and sisters this year . . . because it touched me. It contains five short stories, beautifully written, by Wendell Berry, “an American man of letters, academic, cultural and economic critic, and farmer,” according to his Wikipedia article. All five stories are set in a fictional small-town/rural Kentucky community. The title story in the book—the fourth story in the book—is by far the longest. But I found it profoundly thought- I decided to give this book as a Christmas present to all my brothers and sisters this year . . . because it touched me. It contains five short stories, beautifully written, by Wendell Berry, “an American man of letters, academic, cultural and economic critic, and farmer,” according to his Wikipedia article. The title story in the book—the fourth story in the book—is by far the longest. But I found it profoundly thought-provoking about various cultural assumptions many of us make (in that story’s particular case—assumptions about medical care, family values, death and dying). Fidelity is set in the fictional town of Port William, Kentucky, a place so compellingly simple in its friendships and family ties and its connection to the earth and how it sustains us. Each one of these five stories explores another aspect of this comforting world, wrapping the reader in its gentle embrace. If you are looking for stories of love, loyalty and the value of hard work, look no further than this collection by Wendell Berry.. This slim little volume of stories certainly whetted my appetite for more tales of Port William! The only reason I'm giving it four stars is because I felt a couple of the stories ended too abruptly. Otherwise, I loved it--especially the one about Burley and Danny. WOW. I can't wait to read more Wendell Berry. Five stories in true Wendell Berry fashion - the kind of writing you want to just float around in, enjoying every poetic moment in the woodsy world he lives in. Phrases that stick with you, such as "Her face, it seemed, had been made to smile. It was a face that assented wholly to the being of whatever and whomever she looked at." One of the five stories, "Fidelity" (written in 1993) centers on the efforts of an ailing 82-year old's family to help him get better. Instead, the old man is rushed from his country doctor's office to a distant hospital where he is treated to every life-saving device possible. After a week or so of this with no positive results, a member of the family decides to take action. In 2017, this scenario doesn't seem strange: we have came a long way toward recognizing the right to die. It was originally here that I heard about Wendell Berry, and then I read this about him and wanted to just read everything by him. He's written so much, so I'll spend a lifetime trying to get my hands on all of it, which is a great problem to have. These five stories are all poignant and unique and paint beautiful pictures of his characters that are unlike any others. This was a great read for a breezy summer evening in my hammock between two big trees with a cider in hand. Berry renews one's faith in straightforward storytelling. He has peopled his mythical Kentucky county with characters who have a strong connection to the land and to each other. Wonderful dialogue and wry sense of mountain humor. The story of the soldier returning home and the title story of a son who takes his dying father out of a city hospital stand out. "Pray without ceasing" the first of his 5 short stories had me weeping on the back deck while I read it. I haven't cried that hard in years. I am a child of forgiveness . . . wow. Absolutely a stunning story. Some of the others were very good but none were as moving as the first. I enjoyed "Fidelity" a lot because I got to see the end of Burley Coulter's life. Good stories; I really enjoy Wendell Berry! I have a serious soft spot for the writing of Wendell Berry. Some may think him a bit sentimental, and that's probably fair, but he writes with such love for his characters and the land in which they live that it is hard to resist him; I have given up trying. For those of you unfamiliar with the novels and short stories of Wendell Berry, they take place in the town of Port William and thereabouts. These are fictional locales in Kentucky, though they are very similar to where Berry has been a farm I have a serious soft spot for the writing of Wendell Berry. Some may think him a bit sentimental, and that's probably fair, but he writes with such love for his characters and the land in which they live that it is hard to resist him; I have given up trying. For those of you unfamiliar with the novels and short stories of Wendell Berry, they take place in the town of Port William and thereabouts. These are fictional locales in Kentucky, though they are very similar to where Berry has been a farmer and resident for many years. They are farmers, merchants, barbers, churchgoers, hunters, fishers, wives, mothers, husbands, fathers, and all manner of related and unrelated family. The most salient feature they share is a deep and abiding love for where they live and the people there. While not all are kind and generous, for the most part they are decent people who wish each other well. (The first story in this collection may seem to give the lie to this assessment, but you will no doubt find that decency wins the day even there). Now, you might well say that all of this seems a bit far-fetched, that the ways in which these plain folks interact is unrealistic, perhaps even mythical. If that is the case, I think you may have missed the point. Port William is an allegorical place with an allegorical connection to the reality most of us inhabit, an intentionally stark contrast to the loud, boisterous, thrusting, heedless way in which most of us live our lives. While I have no desire to take my place in a rural paradise nor to make my living from the soil, I do wish with all my heart that we could simply treat each other with respect, kindness, and consideration. This is what the stories of Wendell Berry tell us is both possible and the most desirable outcome of all. While I loved all of these stories, I do have to say that the title story, while a wonderful tale in the spirit of all the rest, devolves at one point into a rather puzzling screed bordering on libertarianism concerning the health care system. As a nurse, I was particularly distressed that the people in the story believed that the medical care system would not have taken their wishes into account when it came to the end-of-life care of their family member. I strongly suspect little research was done for this story and, had it been, Berry would have discovered that health care personnel are highly sensitized to the tension that exists between giving responsible care and overdoing it. The Coulters and Branches would have found ample advocates had they expressed reservations. This is a compilation of five short stories set in the small town of Port William. I love this town, these people, this hardworking, tight-knit community. These stories are not filled with dramatic climaxes and endings, they are simply stories of people. People who you grow to know and care about, stories of life. Berry is able to write from the perspective of multiple characters and develop them in such a way that connects the reader to them. Of Berry's books, this is only my second but he is b This is a compilation of five short stories set in the small town of Port William. I love this town, these people, this hardworking, tight-knit community. These stories are not filled with dramatic climaxes and endings, they are simply stories of people. People who you grow to know and care about, stories of life. Berry is able to write from the perspective of multiple characters and develop them in such a way that connects the reader to them. Of Berry's books, this is only my second but he is by far one of my favorite authors because of them. Slow, sweet, and thought provoking. I found myself smiling at little things. Great book that reminds you to slow down and savor life. The first story was my favorite- what a powerful story of forgiveness. Great introduction to Wendell Berry— Can’t wait to read more! I really like the peaceful country setting, older time, and familiar small town relationships this book was set in. I'm never finished with a Wendell Berry book. They're friends. Very descriptive writing, eloquent narratives, and likable characters are what saved this book. Other than that, 3/5 of the stories were a big snore-fest. Notable stories: A Jonquil for Mary Penn, Fidelity.